Today we were joined by three of our four Rotary Youth Leadership Awards winners from the High Schools and one of their counselors. 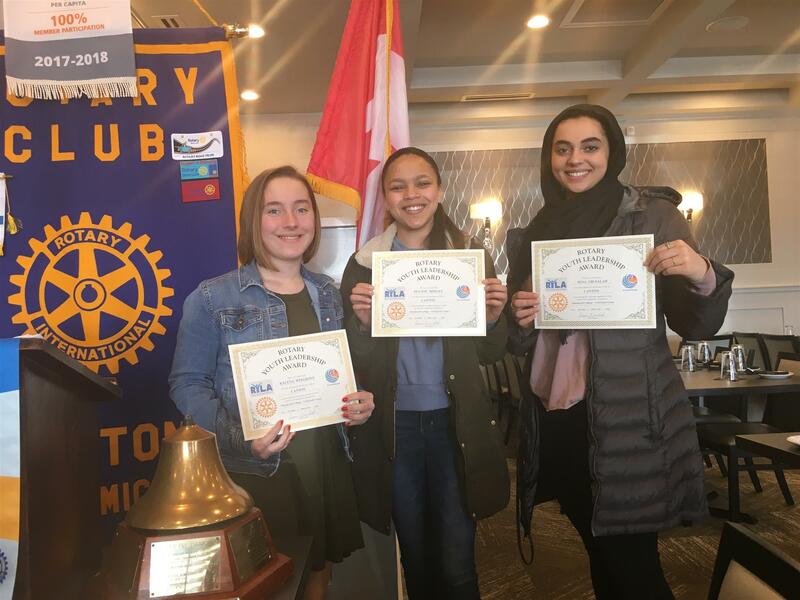 We started out on time at 12:05 p.m. We enjoyed guests today from the local High Schools who attended the District Rotary Youth Leadership Awards in November at Schoolcraft College. This is a three day seminar for high school students who are taught leadership skills through a variety of activities, games, and dynamic speakers. Our four attendees were Rebekah, Peyton, Sena, and Kalena. One of their counselors, Erin Demarest, was also our guest. We also welcomed back Andrae Townsel as our guest; Andrae is interested in membership in our Club. Our Assistant District Governor Russ Jones also joined us for this meeting. We extend a warm welcome to all of our guests. Announcements today included a reminder about Westland Rotary's Magic show on March 30th, Dearborn Heights Mardi Gras Party on April 13th, District Assembly at Schoolcraft College on April 6th, and the District Conference Backpack Collection for delivery on May10th at District Conference for the Windsor Schools underprivileged students. We welcomed Lisa Kennedy back from her President Elect Training Seminar; she said it was a good weekend but very busy and full of information. Bill Tesen celebrated his birthday (actually on March 14th) with a rousing chorus of Happy Birthday from the Club. After lunch our RYLA students spoke to us about their experiences at the training. Peyton and Sena said that the Presentation Skill training stood out for them. Kelena was impressed by the Team Building exercise, and she enjoyed meeting new people. The Club members mentioned that they were very impressed by these young people, especially their ability to get up and talk to a group of people, leaving a lasting meaningful impression. Congratulations to all of our RYLA students.